Farm School NYC began as a collective vision in 2007. Our early planners realized we have so many resources in New York City – many diverse community gardens and urban farms, a network of supportive greening organizations, and excellent educational opportunities. At the same time, we realized we needed something more-- a way to gain a comprehensive farming education. For three years, a network of individuals and groups came together to plan the school. Farm School NYC finally opened for classes in January 2011. WHAT MAKES FARM SCHOOL NYC UNIQUE? Committed to grassroots social justice. Farm School NYC provides students with the tools they need to become effective and empowered grassroots leaders in the food justice movement. We do this by teaching effective community organizing and advocacy techniques as well as engaging in dialogues about larger social, economic, and racial, and justice issues. Community-based approach. Farm School NYC was created by a vast network of urban farmers, community gardeners, and anti-hunger and food justice advocates in the city. 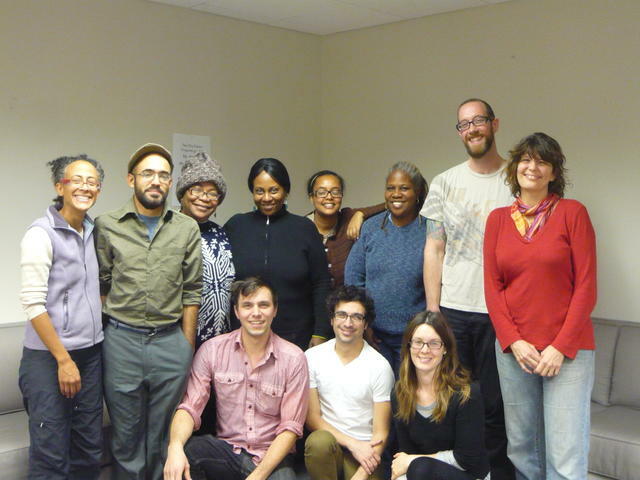 The program is created and run by grassroots leaders who know NYC's unique communities and food issues best. Accessible to all NYC residents. Farm School NYC aims to cultivate a student body representative of the incredible diversity of NYC. Our students come from a wide range of different backgrounds and life experiences and diversity is crucial to the success of our program. As part of our commitment to social justice and diversity, tuition is on a sliding scale based on income and household size. In addition, the time commitment and schedule of the program is designed to be accessible to students working full time jobs. NYC is your classroom. Farm School NYC classes take place at a wide variety of city gardens, farms, and other unique classroom spaces in order to engage in city specific place-based education. Founded by a collective of urban farmers, gardeners, educators and activists, Farm School NYC continues to be guided by a community of advisers. Our faculty operate at the forefront of urban agriculture and social justice, leading some of the most well-regarded urban farms and gardens in our region. Find out more about Our Faculty. Our team collaborates with multiple committees to ensure that the school's guiding principles are upheld, providing our students a comprehensive, professional and participatory education in urban agriculture and food justice. Learn more about Our Team. Our board members are veterans in sustainable urban agriculture and nonprofit management. Read more about Our Board.